Incoming Webhooks are a simple way to post messages from apps into Slack. Creating an Incoming Webhook gives you a unique URL to which you send a JSON payload with the message text and some options. You can use all the usual markup and attachments with Incoming Webhooks to make the messages stand out. You can't use Incoming Webhooks with Workspace Apps right now; those apps can request single channel write access and then use chat.postMessage in the Web API to post messages, providing very similar functionality to Incoming Webhooks. There are a few HTTP request examples in our guide, and to test these you can use something like cURL (a simple, ubiquitous tool for sending HTTP requests on the command line) or if you prefer a GUI you can also use a tool like Postman. Pick a name, choose a workspace to install your app to (bearing in mind that you'll probably be posting lots of test messages, so you might want to create a channel for sandbox use), and then click Create App. If you've already created one, you can use it too, also have a cookie 🍪. After creating, you'll be redirected to the settings page for your new app (if you are using an existing app, just load its settings via the Your Apps page). From here select the Incoming Webhooks feature, and click the Activate Incoming Webhooks toggle to switch it on. If you already have this activated, well you deserve another cookie 🍪. Now that Incoming Webhooks are enabled, the settings page should refresh and some extra options will appear. One of those options will be a really helpful button marked Add New Webhook to Workspace, and you should click it. That URL is your shiny new Incoming Webhook, one that's specific to a single user, and a single channel. We've kind of run out of cookies, but nice work anyway! Let's see how you can actually use that webhook to post a message. Later in this doc we'll explain how to make your messages more expressive or interactive, but for right now something simple will do, so we're going to use that old standby - "Hello, world". The URL that you're making the POST request to should be the same URL you generated in the previous step. That's it! Go and check the channel that your app was installed into, and you should see that the "Hello, World" message has been posted by your app. You can use this in a real Slack app without much change, just substituting your favorite HTTP Request library for cURL, but structuring all the requests in the exact same way. You will also need to pay attention to some details we've outlined below when you're distributing your app. Great work, you've set up Incoming Webhooks for your Slack app and made a successful test call, and you're ready to start making those messages more interesting and useful. Also, we baked some extra cookies to celebrate 🍪🍪🍪🍪. Incoming Webhooks conform to the same rules and functionality as any of our other message related APIs. You can make your posted messages as simple as a single line of text, or make them really complex with interactive buttons and menus. This example uses message attachments, message buttons and menus, and some additional formatting fields. You can also use the Message Builder to preview and test your message JSON before you send it. We also have some fantastic docs that explain how to make your messages more interesting and interactive, so please dive into our guide to Composing Messages. For more info on threads, check out our guide to threading messages. In the guide above we showed you how to quickly generate a webhook URL through your app settings UI, but when you're distributing your app (for use by non-collaborators), you'll need a way for it to generate those URLs on the fly. Fortunately, Incoming Webhooks can be easily generated during the standard OAuth install flow. If you are going to distribute your app, it's likely you were already going to use the OAuth process anyway (if you're building a Workspace app see the note below), so we'll just cover the adjustments you'll need to make. As part of the install process, your app defines a set of initial permission scopes to request from a user. 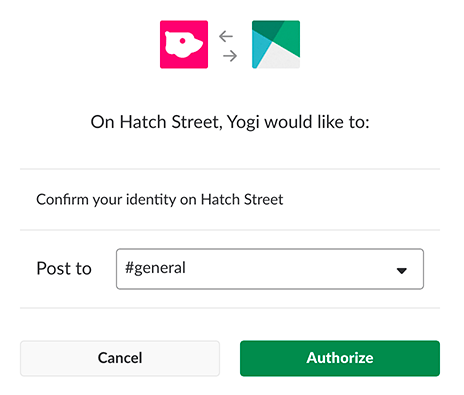 Whether you're using the Slack button to provide a link for users to install your app or your own custom OAuth redirect, there will be a scope parameter that sets this initial list of permissions. To generate Incoming Webhook URLs, make sure you include the incoming-webhook permission in that scope list. When you do, users will see an additional permission on the Authorize screen that lets them pick the channel where Incoming Webhooks will post to, as shown above. As mentioned, you can't use Incoming Webhooks with Workspace Apps. Instead, those apps can request single channel write access and then use chat.postMessage in the Web API to post messages, providing very similar functionality to Incoming Webhooks. Though in most cases you'll receive a "HTTP 200" response with a plain text ok indicating that your message posted successfully, it's best to prepare for scenarios where attempts to publish a message will fail. Incoming webhooks may throw errors when receiving malformed requests, when utilized webhook URLs are no longer valid, or when something truly exceptional prevents your messages from making it through to channels and users. Incoming webhooks return more expressive errors than our Web API, including more relevant HTTP status codes (like "HTTP 400 Bad Request" and "HTTP 404 Not Found"). These are described in our changelog: Changes to errors for incoming webhooks. invalid_payload typically indicates that received request is malformed — perhaps the JSON is structured incorrectly, or the message text is not properly escaped. The request should not be retried without correction. user_not_found and channel_not_found indicate that the user or channel being addressed either do not exist or are invalid. The request should not be retried without modification or until the indicated user or channel is set up. channel_is_archived indicates the specified channel has been archived and is no longer accepting new messages. action_prohibited usually means that an admin has placed some kind of restriction on this avenue of posting messages and that, at least for now, the request should not be attempted again. posting_to_general_channel_denied is thrown when an incoming webhook attempts to post to the "#general" channel for a workspace where posting to that channel is 1) restricted and 2) the creator of the same incoming webhook is not authorized to post there. You'll receive this error with a HTTP 403.
too_many_attachments is thrown when an incoming webhook attempts to post a message with greater than 100 attachments. A message can have a maximum of 100 attachments associated with it. no_service means the webhook is either disabled, removed, or invalid. no_service_id means the service_id (B00000000 in our examples above) was either invalid or missing. no_team means the team was either missing or invalid. team_disabled means the team is no longer active. invalid_token means the token used was either invalid or missing.